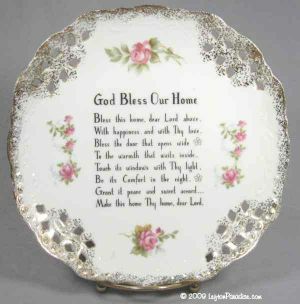 "God Bless Our Home" Plate with Painted Roses - NE1073A Discounts Apply ! This plate is embellished with painted roses and spattered gold. There are four areas of piercing around the perimeter. This flawless piece features a lovely inspirational sentiment. It is 8 inches in diameter, is marked NE1073A and has the Lefton color crown logo.